Easy and light panna cotta that can be perfectly combined with pomegranate or other in season fruit. Follow the steps and surely the result will delight you! Soak the gelatin sheets in cold water until they are soft. In a saucepan, we put the Halta herbal based cream, milk, vanilla and the sugar. Let them boil over medium heat and turn them off. Remove the gelatin sheets from the water and add them to the saucepan mix. Stir well until they melt. Allow the panna cotta mixture to cool for about 30 minutes (to reach room temperature). We divide it in glasses and place in the refrigerator for at least 3 hours until they go firm. Prepare the pomegranate jelly according to the instructions of the pack and let cool for a while. We divide the jelly into the glasses and put it back in the refrigerator to cool. 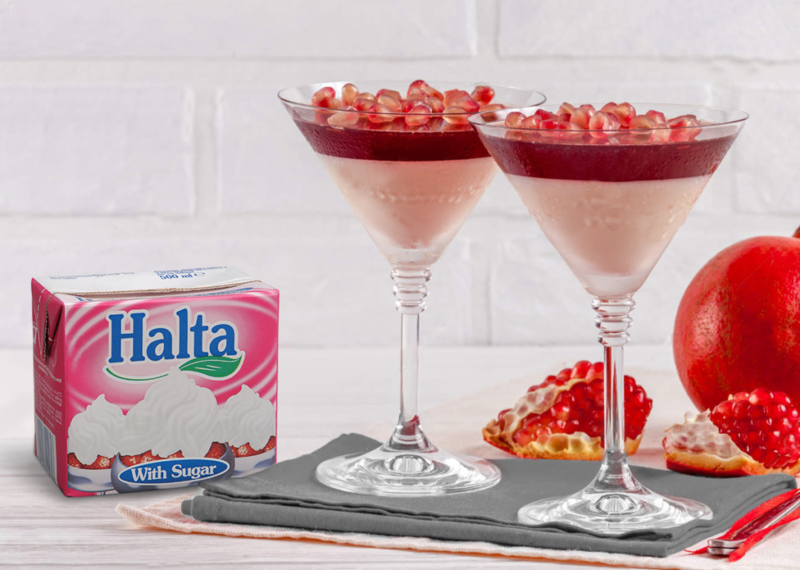 Before serving, garnish with pomegranate seeds in each glass. You can replace the pomegranate jelly with any other jelly of your choice with the corresponding fruits.